former amusement Park creator, writer, animator, etc. Powers/Abilities: Maas was a brilliant inventor, especially skilled in robotics. He was also creative and invented a large number of cartoon personalities, which evolved into Wonderworld, a multi-million dollar enterprise. At the end of his life, he developed delusions of grandeur. Perhaps Maas' greatest invention was his Extended Animation chamber, which allowed his mind and body to function long after his natural death. (Fantastic Four I#263 + 264 (fb) - BTS) - Alden Maas was a creative inventor who developed a series of cartoon characters of great popularity. The success made him enormously wealthy, as did the various franchises that spawned from the cartoons, especially the gigantic amusement park, Wonderworld, in California. Eventually, Maas developed a degenerative nervous disorder, characterized by failing metabolic functions and delusions of grandeur. In the last year of his true life, he came to see himself as the savior of mankind. Maas erroneously deduced that modern concepts of continental drift were completely wrong: He believed that the great land masses were not simply moving relative to each other because they could float on the mantle, but rather the tremendous heat of the Earth's core was expanding the globe like a balloon. Maas continued this theory, coming to the conclusion that the Earth's core had cooled relatively over the millions of years of its life. Because of that, he believed that the expansion had slowed almost to a stop--and since people continued to have lots of babies, soon all the available space on Earth would be filled up. To resolve this perceived problem, Maas developed Project: Worldcore, drilling a shaft deep into the world, all the way to the core. Down the shaft would be pumped lots and lots of heat. The core would be rekindled, even hotter than ever, and once again, like a giant balloon, the Earth would grow and grow, until there was lots of room for everybody. In order to power Project: Worldcore, a source of tremendous heat was needed: a controllable source of heat equal to that of an exploding star. A thermonuclear device was developed as an emergency back-up source, but a more controlled source was desired. The drilling for Project: Worldcore actually began 16.095 years after Maas' death. However, the Extended Animation Chamber, also created by Maas (or perhaps by his robot servants), allowed him to "live" to see his dreams approach fruition. His robots carried out the actual development of the project, occurring on a star-shaped island created by them, to which Maas had secluded himself. Unbeknownst to Maas, the drilling poked a hole straight through Subterranea, allowing magma to flood the region, killing many of the Mole Man's Subterraneans and human Outcasts. (Fantastic Four I#263, 264) - Believing that Johnny Storm, the Human Torch, could provide the controlled heat source that he wanted, Maas established a Grand Prix race course in Wonderworld; he had Storm invited to participate, then used a trap door inside one of the track's tunnels to abduct the Torch while faking his death to the crowd above. Storm was brought to Maas Island and hooked into machines which forced him to use his nova level flame for prolonged periods, channeling the energies down the hole drilled by Project: Worldcore. The Thing, present at the race, refused to believe the Human Torch could have been killed in an explosion, and he suspected foul play. Heading to Maas Island, he was greeted by a holographic icon which explained Project: Worldcore. Maas himself appeared before the Thing, who ignored his requests and tried to free Storm and, in the process, he fell into the immense pit. Crashing at the bottom of the pit, miles below, the Thing was attacked by the Mole Man, who believed the Fantastic Four to have been involved with the perceived assault on his realm. Explaining the truth, the Thing then followed the Mole Man's lead and returned to the surface, where they freed Storm. Maas sent his cartoon robots to delay them, but they were no match for the forces assaulting them. Realizing that his plans were in danger, Maas instructed his servants to prepare his thermonuclear device. As Maas' life energies faded to a dangerous level, his servants held him up so he could reach the master switch to detonate the device. 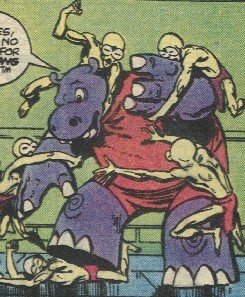 The Mole Man summoned his immense monster, Giganto, who plowed through the 15 foot steel barrier to Maas' chamber, where the Mole Man and his temporary allies found Maas dead...long dead. Explaining the full situation, Maas' servant, Mr. Jones, revealed that there was never any true danger, as they had carefully gauged the powers being released by the Torch, and the thermonuclear weapon did not have the power to fire Earth's core. Jones revealed that all of Maas' servants were simply robots following orders, and they took their former leader's body and began walking into the ocean, intending to continue until the pressures would crush them. The Mole Man and the Thing both figured out that the Earth would not stretch and expand like a balloon, but rather shatter/fissure portions of its mantle, causing eruptions of magma across the surface of the world. I will concede that Byrne's had some mediocre runs on Spider-Man (especially Year One), Spider-Woman, etc. However, he remains one of my favorite writers, and his run on the Fantastic Four continues to be the high point of the series, in my opinion. This story, and the one involving the Emperor, were two of my favorites. Alden Maas' similarities to Walt Disney (who was rumored to have been frozen into suspended animation by his company until a cure could be found to save him) are obvious. But John Byrne also based some of the character on former Marvel artist Neal Adams. The bizarre geological theory that Alden Maas believed in was actually developed by Adams, who has apparently made publicizing it sort of a "pet project" of his for at least twenty years. He plans to publish a graphic novel about it eventually, and details the whole thing at his official website. Byrne is a huge admirer of Adams, but he obviously thought the geological theory was crazy and decided to poke a little fun at it in the Fantastic Four story. Anyway, Alden Maas is an anagram of Neal Adams. other similar Projects, Operations, etc. other "Wonder" characters, groups, items, etc. An artificially constructed island ten miles off the coast of California, to which Maas moved in the final years of his life around 20 years ago. 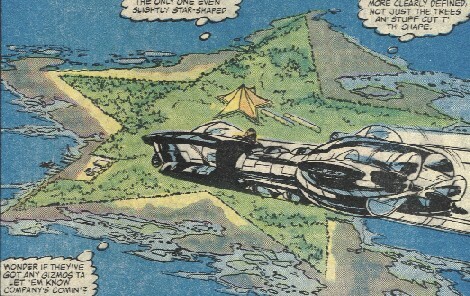 It served as the base for Project: Worldcore, and its originally perfect star shape lost its definition as the materials from the deep pit were dumped off shore. 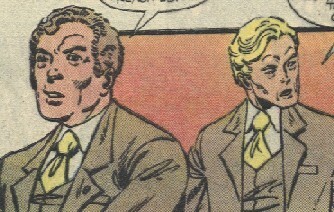 Mr. Jones (blond hair) and Mr. Smith (brown hair) were named. Robotic creations who carried out Maas' orders to the letter. They continued to maintain the pretense that Maas was alive and they continued his plot long after his true death, keeping his mind and body functioning via the energies of the Extended Animation Chamber. Once Maas had completely terminated his life functions, the robots took his body and walked out into the ocean, intending to continue until the pressures would crush them. The unnamed feminine servant to the left also appeared as a hologram to greet visitors to Maas Island and explain the nature of Project: Worldcore. She was presumably robotic as well, and would thus have walked into the ocean to her destruction after Maas' final death. An immense amusement park in California, based on the cartoon creations of Maas, including Maxie Mouse, Hopalong Hippo, "Gerry Giraffe," "Dingaling Duck," "Murgatroid Mutt." 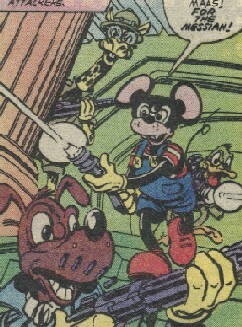 On Maas Island, robotic versions of the cartoon characters existed and could be used as defense, armed even with blaster guns. These robots were constructed of normal materials and possessed perhaps slightly superhuman physical abilities (well, Hopalong Hippo was pretty strong, anyway).